Atlanta, GA—Anyone in doubt that natural hair is here to stay needed to be in Atlanta this weekend at 'Fro Fashion Week, where women traveled from across the country, and companies large and small gathered, to celebrate natural hair in all of its beauty. 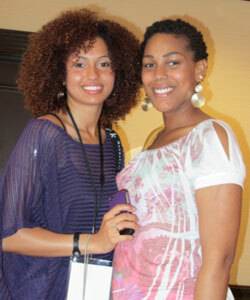 Two women traveled from Raleigh, N.C., to celebrate their natural kinks at 'Fro Fashion Week. 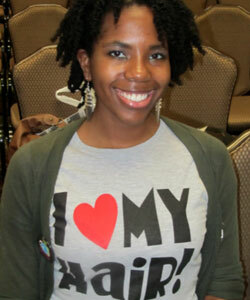 Women in all stages of their natural hair journey—from those considering chopping off their relaxer to those who have celebrated their kinks for years—flocked to the event at the Crowne Plaza Atlanta Airport for the 3-day event. 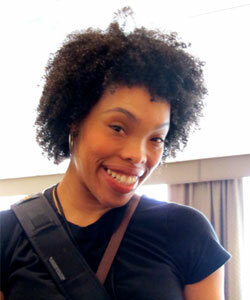 Woman shows her curl pride at 'Fro Fashion Week. 'Fro Fashion Week featured a wide array of activities, including a natural hair blogger panel, a movie screening and discussion of "My Nappy Roots" and plenty of mixing and mingling. 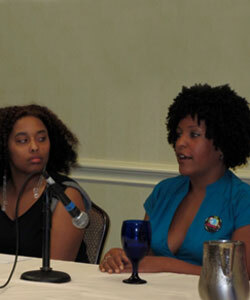 Participants listen to a panel of natural hair bloggers, many aspiring to start their own blogs. The event, the first of what founder and Naturally Me! CEO Tarin Boone hopes will be many around the country, seeks to highlight trendsetting events, people and businesses within the natural hair, skin and beauty industries. Photographer Erika Collier was forced to relax her hair when she turned 12. For years, she straightened her kinks. "I used to try to straighten it—camouflage it," Collier said. 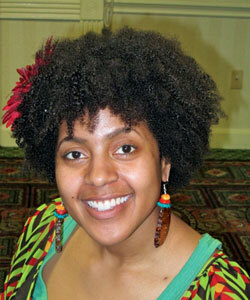 Today, she views her natural hair as one of her biggest assets. At a recent national talent competitions for models and actresses, Collier won "Best Overall Mature Commercial Model." "It was encouraging because I was me," Collier says. One head of natural hair was just as beautiful as the next at 'Fro Fashion Week.